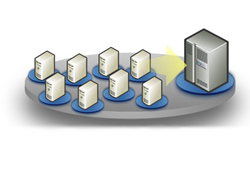 On virtual machines the network adapter is named as VMware accelerated AMD PCNet adapter. Now you know where to look out for changing IP addresses. 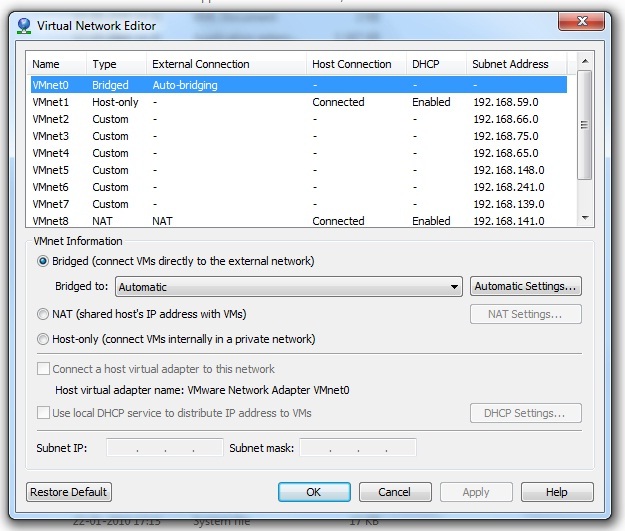 By default there are two virtual DHCP servers doing the work of assigning IP addresses to machines on the virtual network. The rest are named as VMnet2, VMnet3 and so on. They are reserved for custom usage and can be used through vmnetcfg.exe about which I’ll be talking next. The vmnetcfg.exe is a very important file which comes handy for configuring custom settings for virtual DHCP servers and for adding more switches. However you can’t find this file with the default installation of VMware player so you need to copy this file manually using the following steps. Install VMware player to a location in the hard disk e.g. C:\Program Files\VMware Player. Open the setup file VMware-player-3.0.1-xxxx.exe againand wait for setup to load. Now keeping the installation wizard open navigate to your temporary files location which is usually C:\Windows\Temp. Locate a file named network.cab and extract it. Inside you’ll find the precious vmnetcfg.exe (you’ll discover why its precious later). Copy the file vmnetcfg.exe into your VMware player installation location in our case it is C:\Program Files\VMware Player. Fantastic, just what I needed to turn off their DHCP so I can use my own. Maybe now I can get rid of the extra adapters too 🙂 Thanks! The UI comes already along with the player.